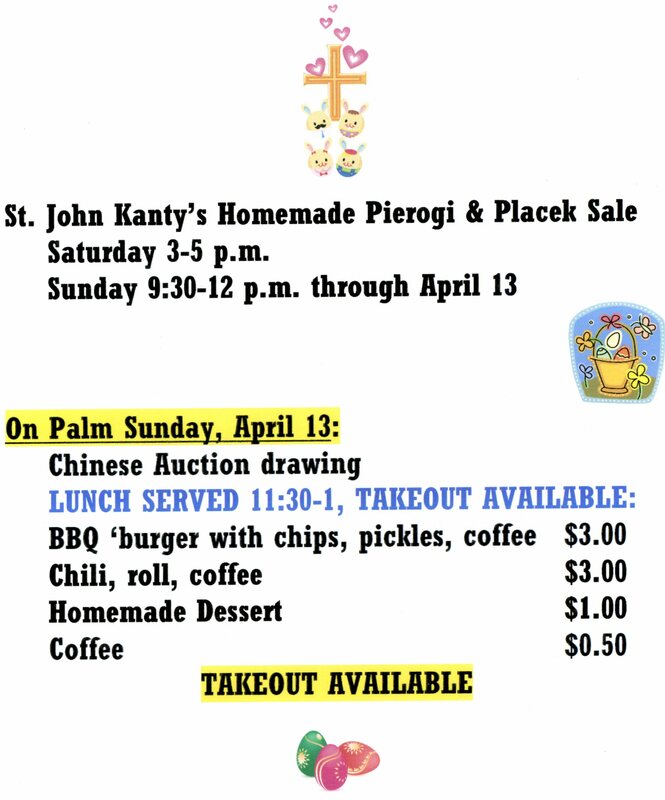 St. John Kanty Church - Buffalo, NY > News > News > Palm Sunday at SJK…last day to purchase your homemade placek & pierogi! Palm Sunday at SJK…last day to purchase your homemade placek & pierogi! Start with 10:30 Mass, buy a ticket for the Holy Name Society Basket of Cheer raffle (6 tickets for $5; drawing on Sunday), then stop down to Kanty’s Kafe: last day until next year to buy homemade pierogi & placek! Also serving lunch from 11:30-1: BBQ burgers and chili, with homemade dessert and coffee. Our large Chinese Auction raffle will be drawn around 1 p.m. Join us for a great start to Holy Week! !